Did you know that Daily Prayer has an online Bible? You will find the link to it by putting your cursor on “Bible” in the top navigation. 197 people in our community are currently praying with you. May I trust God that I am exactly where I am meant to be. May I not forget the infinite possibilities that are born of faith. May I use those gifts that I have received, and pass on the love that has been given to me. May I be confident knowing I am a child of God. O Holy One, I call to you and name you as eternal, ever-present, almighty, and boundless in love. Yet there are times, O God, when I fail to recognize you in the everyday routine of my life. There are times timidity clenches my heart and I hide my faith from the world and even from myself. Sometimes fear makes me so small that I miss a chance to express my belief. Doubts and insecurity suppress the wonderful wisdom I have learned, from your holy word, from listening to your teachers, and from the quiet voice of the Holy Spirit. 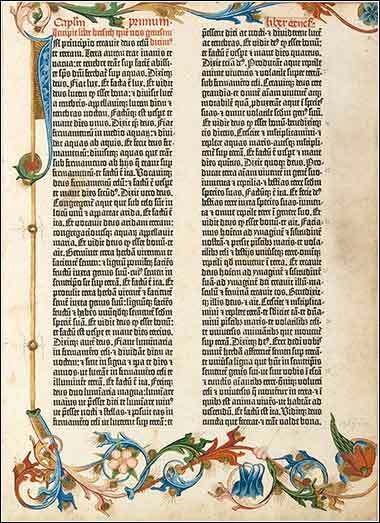 A page from an early Gutenberg Bible. For those readers who are new to Daily Prayer, we often take Wednesdays off from whatever we are studying, for “something completely different” (with apologies to Monty Python). It seemed like a good idea to take a look at, not the contents of the Bible, but the story of the book itself. he Bible is the biggest-selling book of all time; there is no other that even comes close. That may not surprise you, but how about this? The Bible was the first major book ever printed (by Johannes Guttenberg in 1454) and it has been the biggest-selling book every year since. You heard me right. In 2014, in 1957, in 1888, in 1620: the Bible has been the best-selling book in the world every year(It is possible that Mao Tse-Tung's Little Red Book outstripped the Bible for one or more years in 1967-1972, but there are no accurate figures for it.) since the printing press was invented. Today, there are over 100 million Bibles printed every year, not including innumerable e-book downloads. If somebody asked you how many books there are in the Bible, or the New Testament, would you be able to tell them? The New Testament has 27 books. The Old Testament, however, is different in different major denominational groups. The Protestant Bible has 39 books in the Old Testament, for a total of 66. The Catholic Bible has 73, and Orthodox Bibles even more — the number varies among the major divisions of Orthodoxy. Why the difference? It really is not as major as it sounds. Protestants are encouraged to read the seven extra books in the Catholic Bible. Until recently, they were actually included in Protestant Bibles as “The Apocrypha”, but as people began to want lighter and shorter Bibles, they were excluded. In this context, when we talk about the Bible, we are referring to the collection of books that Christians believe are the inspired and inerrant Word of God. There is a word for this: the “canon”. So, the Catholic canon is 73 books; the Protestant, 66. The reasons for this are actually not doctrinal so much as historical. There was no Hebrew Bible in 100 A.D.! Judaism did not collect, consider, and compile a standard canonical Hebrew Bible — the Tanakh — until around 900-1000 A.D. A group of scholars in Israel called the Masoretes spent centuries sifting through Hebrew Scripture (and adding vowel marks) and the “Masoretic Text” was finalized in the 11th century. Instead, early Christians had relied on a Greek book of Scripture, compiled by Hellenized Jews in Alexandria (the world's great center of learning at the time), called the Septuagint. The Septuagint was finalized around 300 B.C. (The name comes from the fact that there were seventy scholars who did the work; you might recognize the Greek root sept-, meaning seven, as in Sept-ember, the seventh month.) So, when the Christian Bible was was being standardized during the years 300-400 A.D., it adopted the only complete Old Testament available: the Septuagint. Protestantism developed in the 1400s and by the time the Protestants decided on a canonical Bible, the Masoretic Text had been finished in Hebrew. They considered it more authoritative and so adopted it, rather than the Greek Septuagint, as their Old Testament.